What could be better then enjoying your summer nights with this dish? For those of you who love fish dishes in the summer, this recipe will be for you! 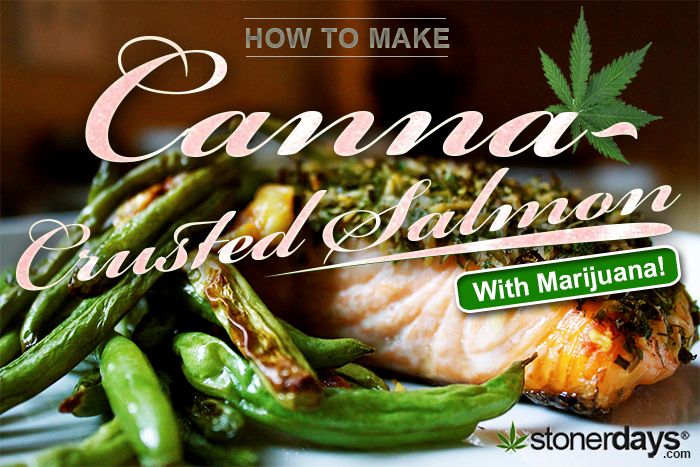 This amazing dish is easy to prepare and will give you an amazing medicated salmon that your friends will absolutely adore. The following recipe will make four servings so if you plan on making it for more or less, be sure to adjust the ingredients accordingly. As always, be sure to preheat your oven, this time to 400 degrees. Take a large mixing bowl and combine salt, pepper, medicated trail mix, flour, cannabis, can cheese. Mix everything together well. Be sure to clean your salmon pieces well and then coat them in the flour mixture and set them aside on a piece of tinfoil or wax paper. Using a 9×13 baking pan, melt the cannabutter in the oven that you’ve already preheated. Once the butter is melted, place the salmon steaks on the pan and baste the side facing up with some of the butter in the pan. Bake them like this, uncovered for about 15 minutes. Turn them over and turn the heat in the oven down to 350 and bake them for another 15 minutes or until they’re tender. Serve them while they’re hot, possibly with a side of cannabis seasoned veggies! This entry was posted in Stoner Blog, Stoner Cookbook and tagged cannabis, marijuana cookbook, stoner cookbook.